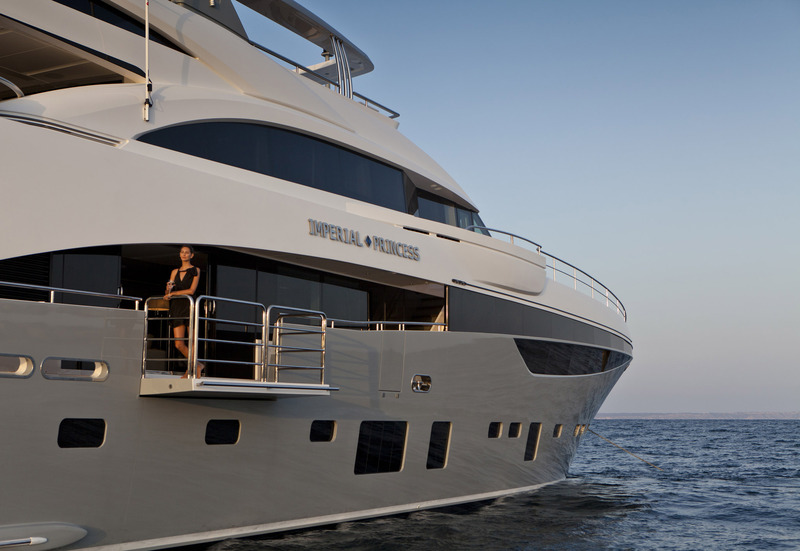 Motor yacht IMPERIAL PRINCESS BEATRICE (ex IMPERIAL PRINCESS) is a spectacular Princess 40M vessel, launched in 2012 by the prestigious UK-based shipbuilder, Princess Yachts. 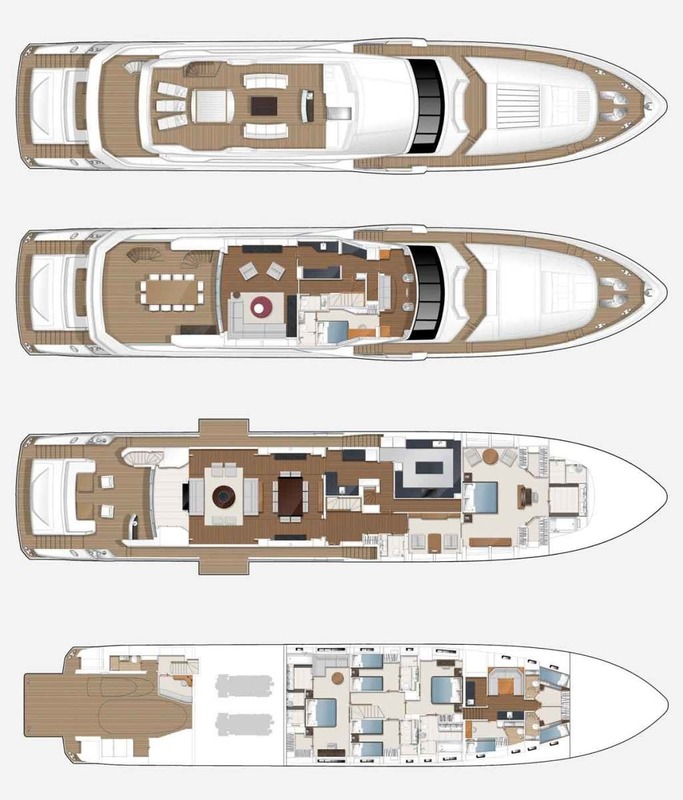 Boasting striking grey hull, white superstructure and grey hard top as well as mast, the 130´ IMPERIAL PRINCESS BEATRICE superyacht was the longest production vessel ever made in Britain, with the largest resin-infused hull ever molded. 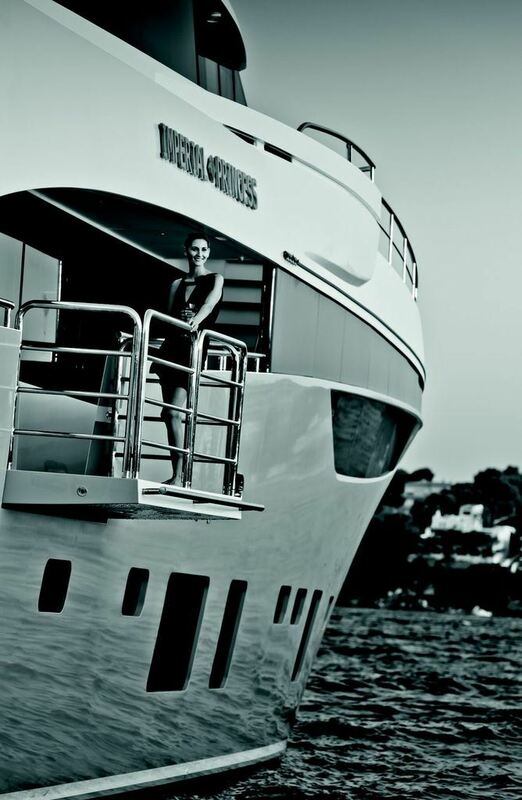 Yacht IMPERIAL PRINCESS BEATRICE boasts naval architecture, exterior design/styling and interior layout by Bernard Olesinski and her lovely interior is designed by Princess´ in-house team, in partnership with the renowned studio, Bannenberg & Rowell. 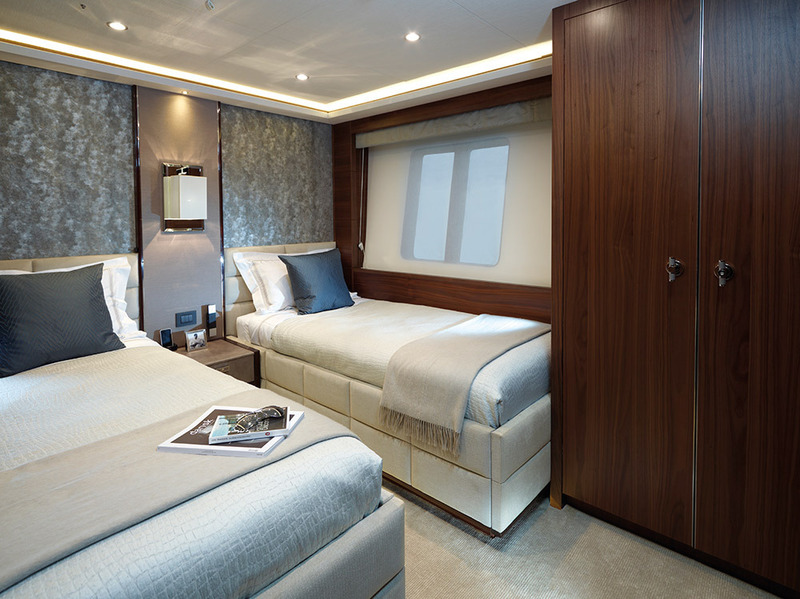 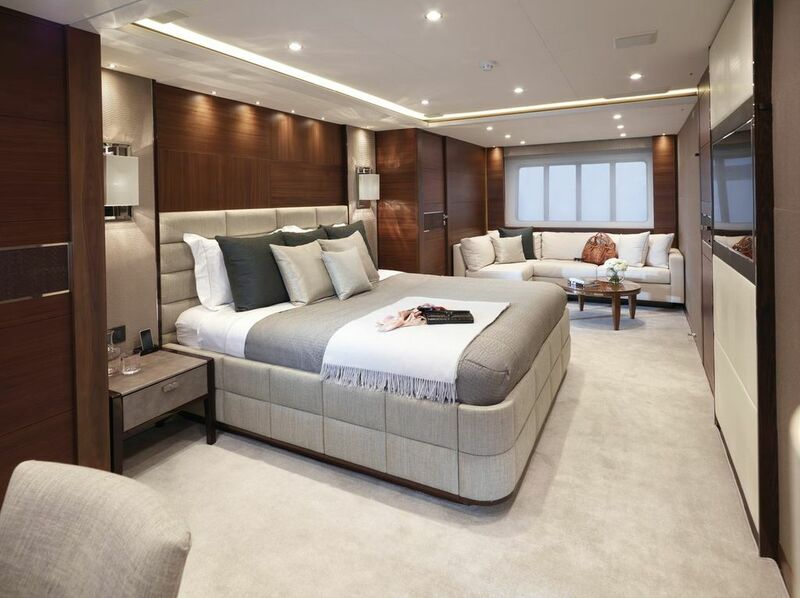 The five-cabin six-star accommodation layout for up to 12 charter guests aboard the luxury yacht IMPERIAL PRINCESS BEATRICE offers a master suite, two VIP staterooms as well as two twin-berth en-suites. 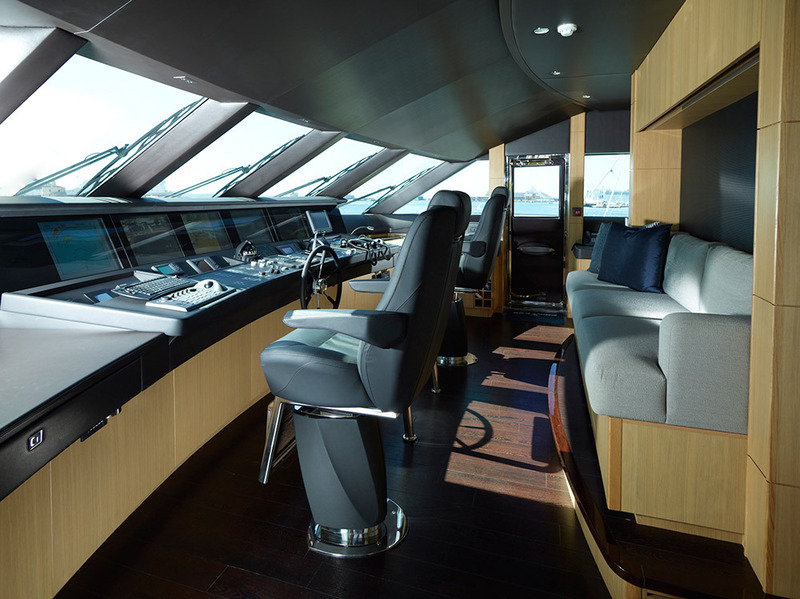 The interior is a classic confection of contrasting tones, textures and surfaces, full of visual and tactile treats, set off to perfection by the huge areas of window, which will fill both the main deck and accommodation areas with daylight. 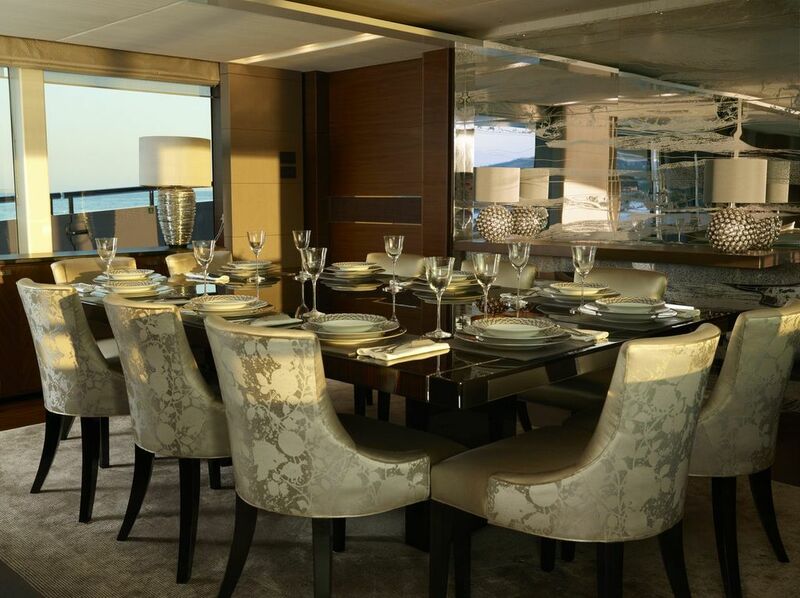 A stand out feature on the charter yacht IMPERIAL PRINCESS BEATRICE is her magnificent main deck with a beautifully appointed saloon and formal dining area encased by vast windows and hydraulically folding balconies on both sides of the saloon. 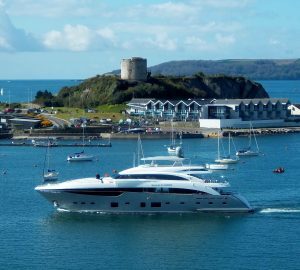 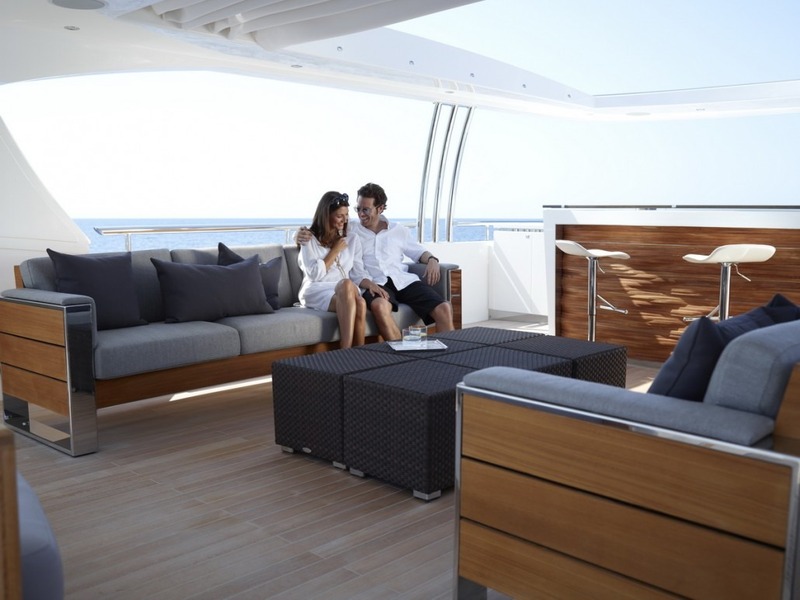 Up one level, the elegant sky lounge is a great place to relax with commanding views as well as an additional exterior dining area for breakfast, lunch, dinner or cocktails. 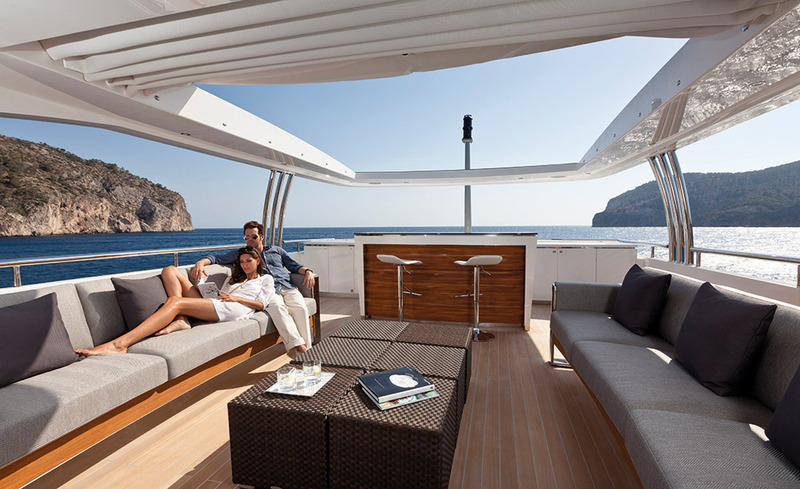 A curved stairway leads up to the impressive Sun Deck boasting an extensive bar, seating, sunbathing and a huge spa tub. 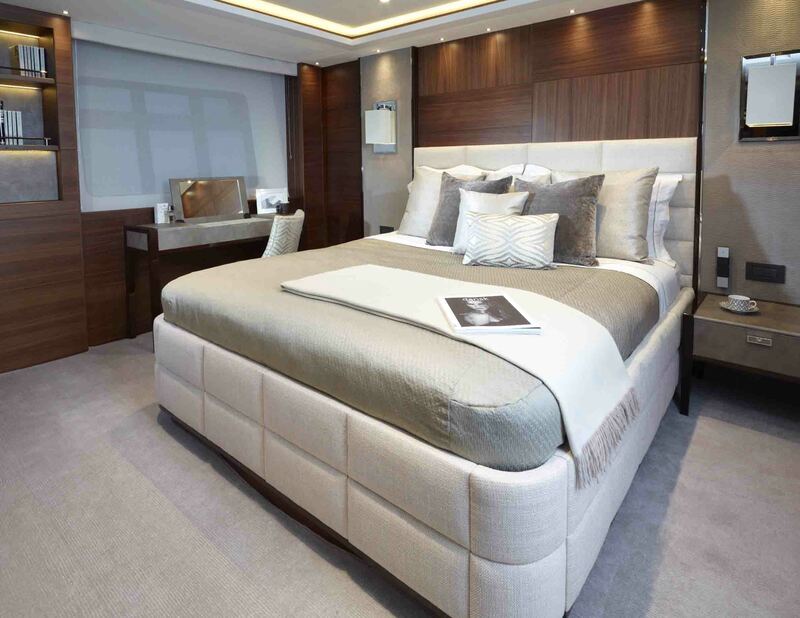 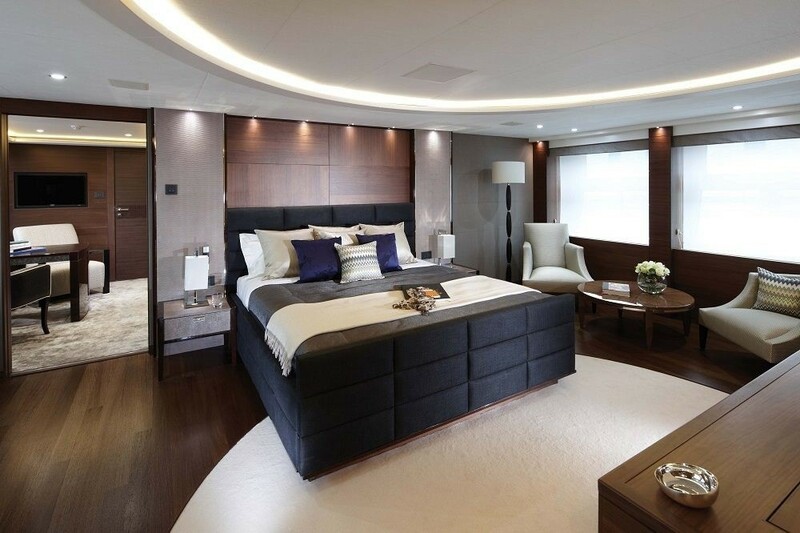 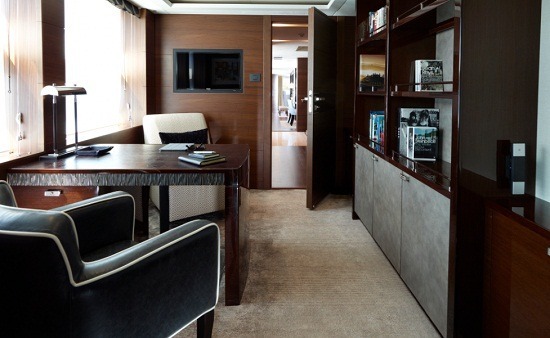 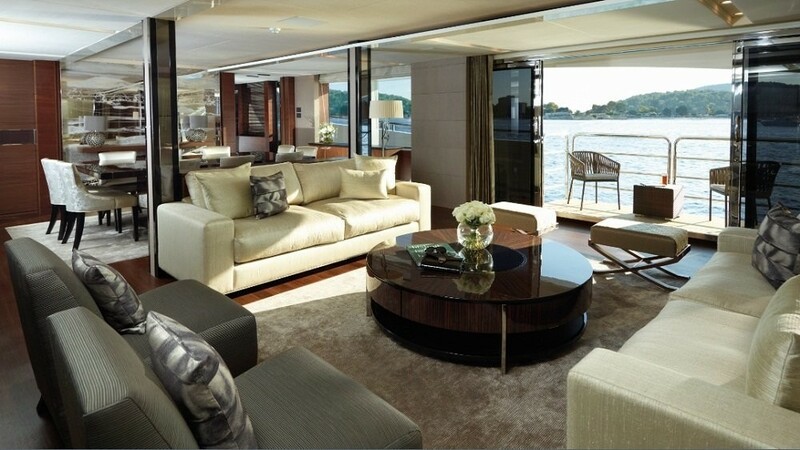 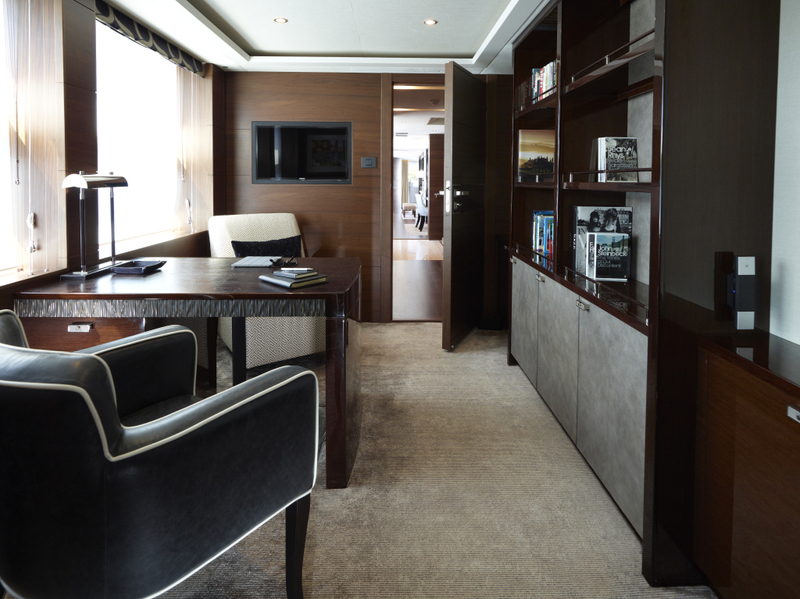 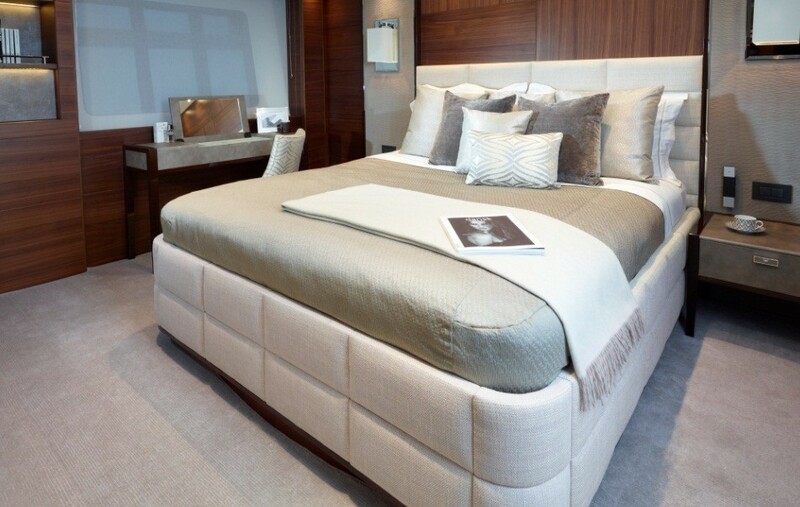 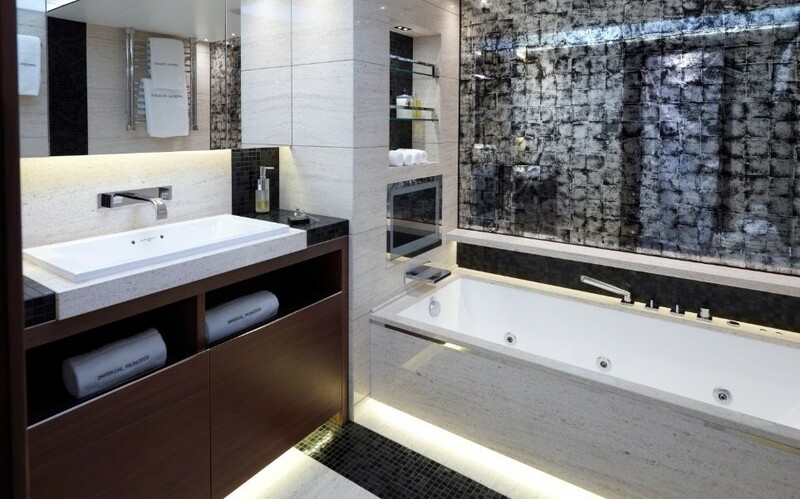 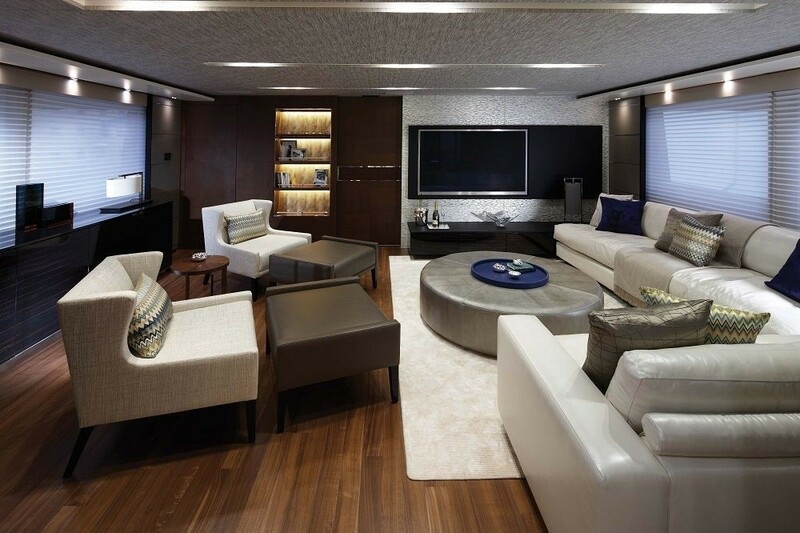 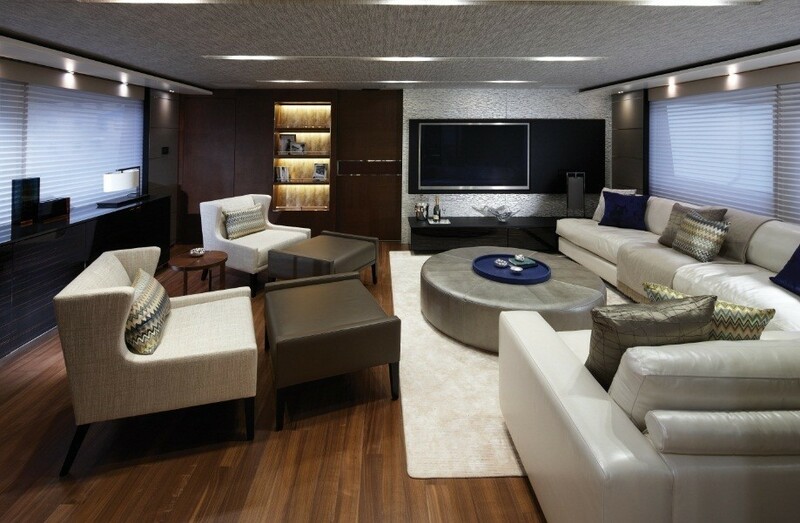 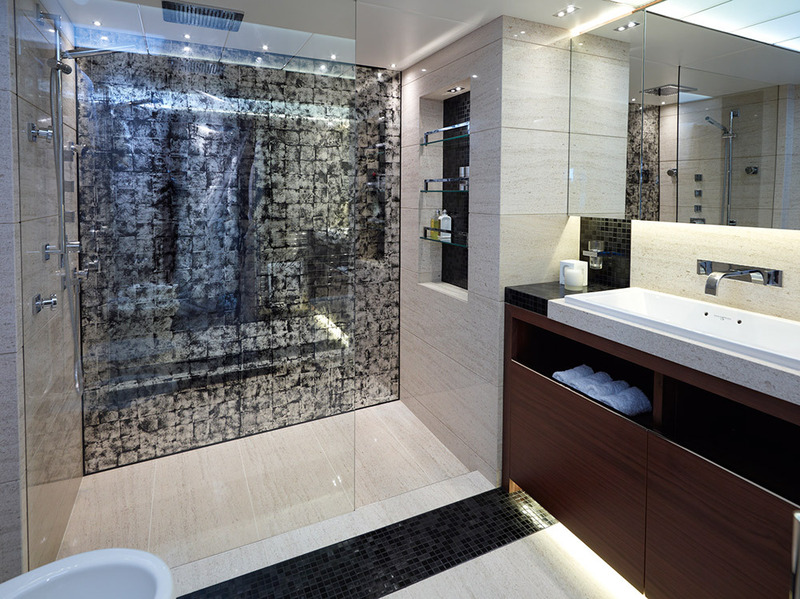 The IMPERIAL PRINCESS BEATRICE yacht’s principal decorative scheme boasts horizontal-grained satin walnut bulkheads, wenge flooring on the main deck, and walnut flooring on the sky deck. 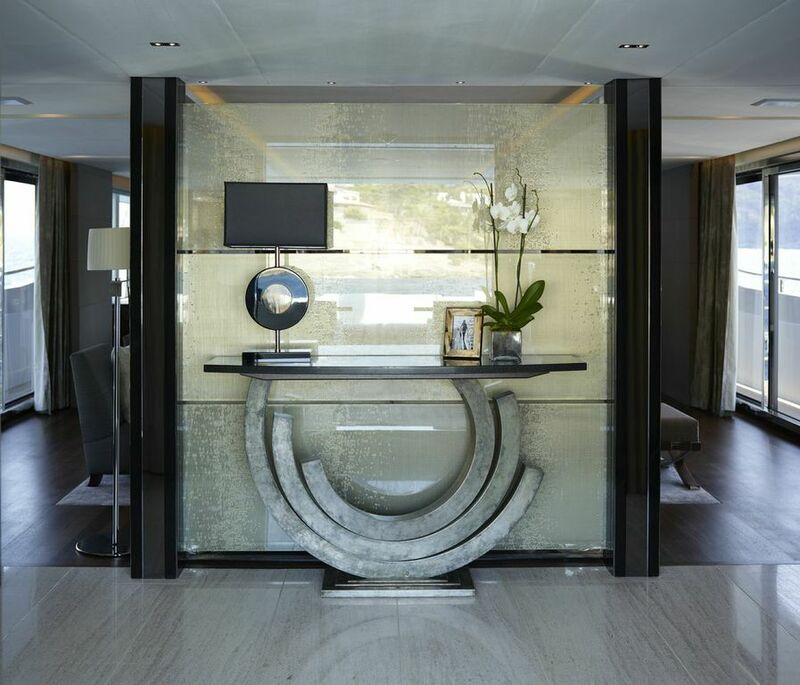 Signature pieces represent the impressive, full-height, etched-metal mural by Christofle in the dining room, and there is also an eye-catching abstract created from hand-painted and lacquered panels on the forward bulkhead of the sky lounge. 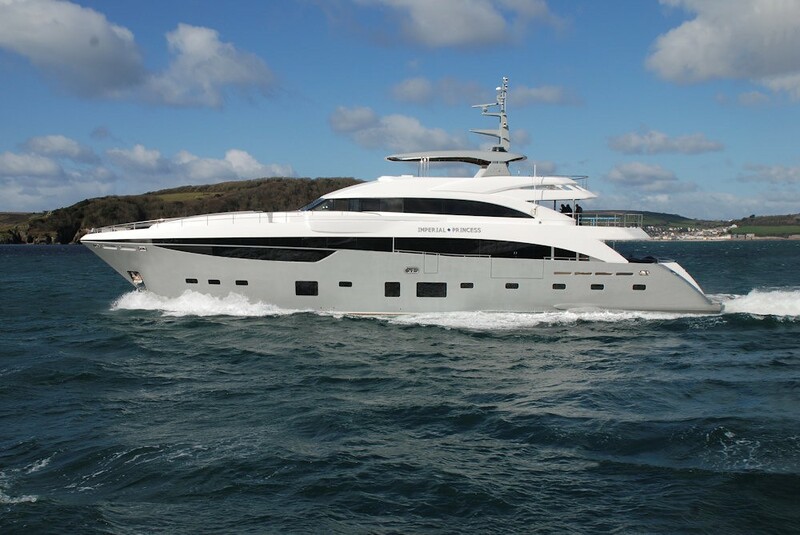 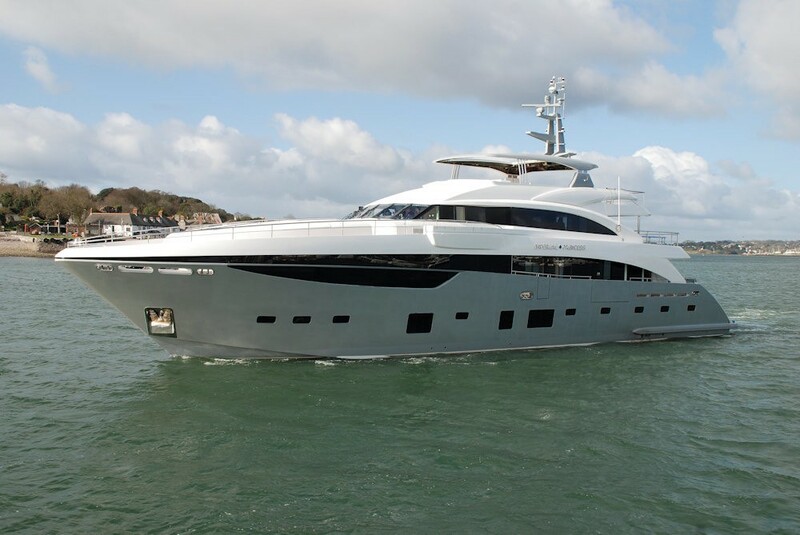 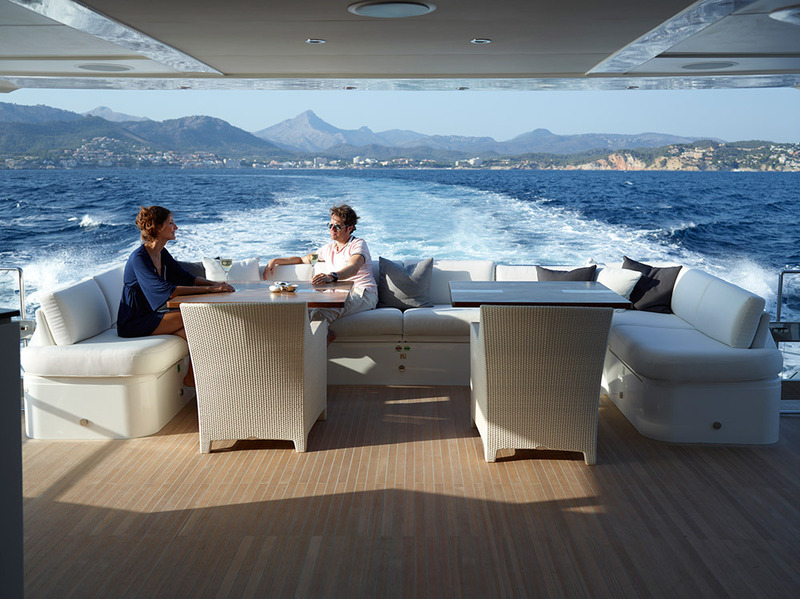 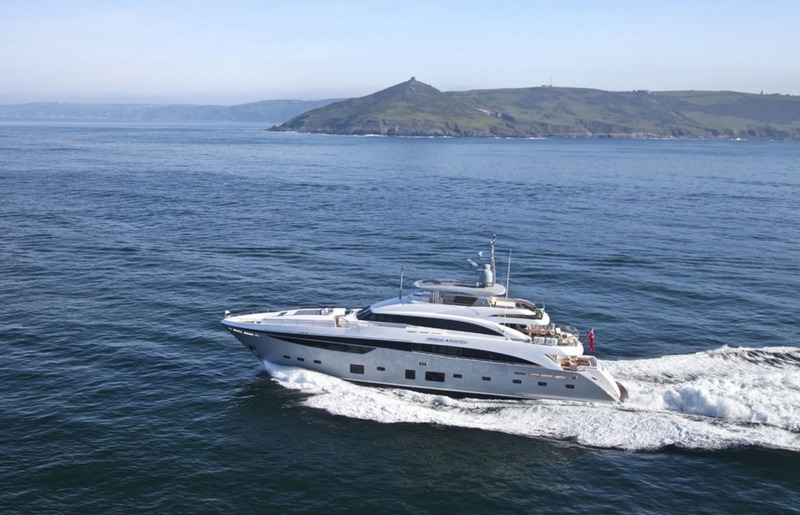 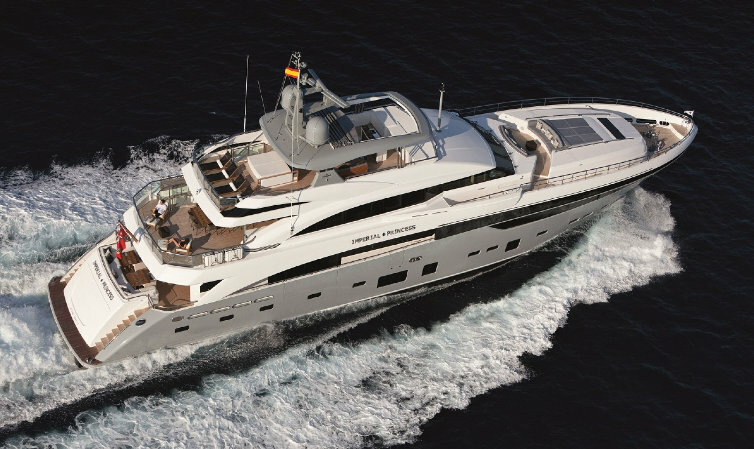 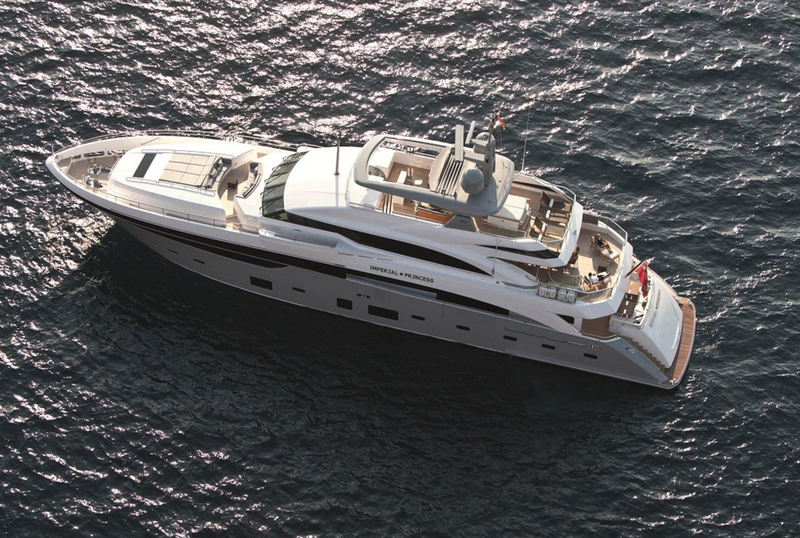 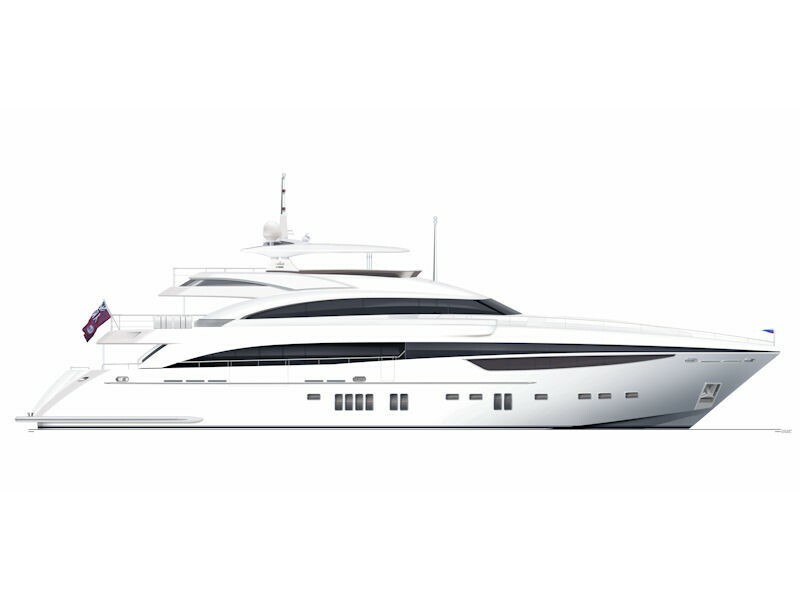 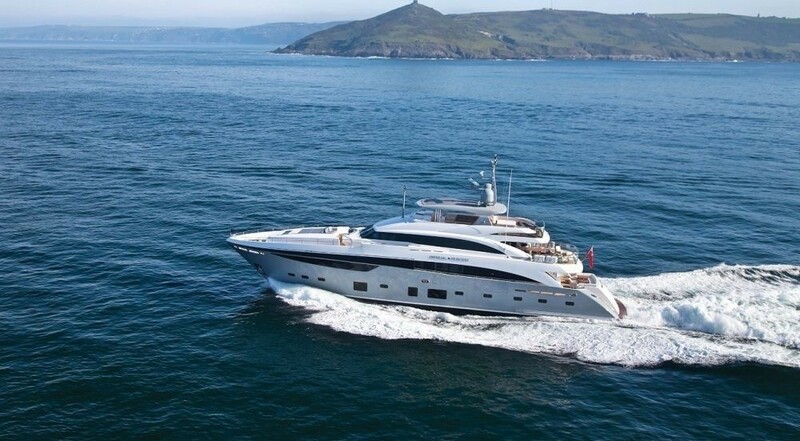 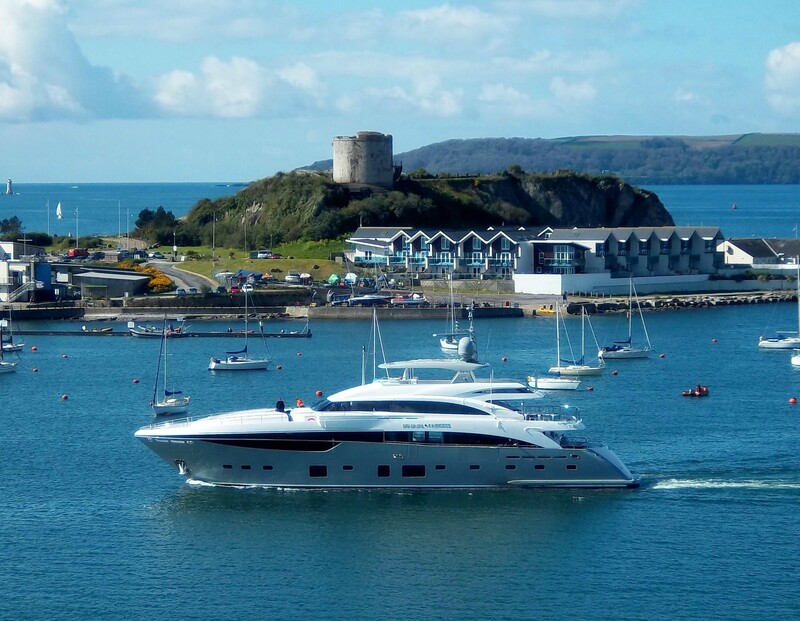 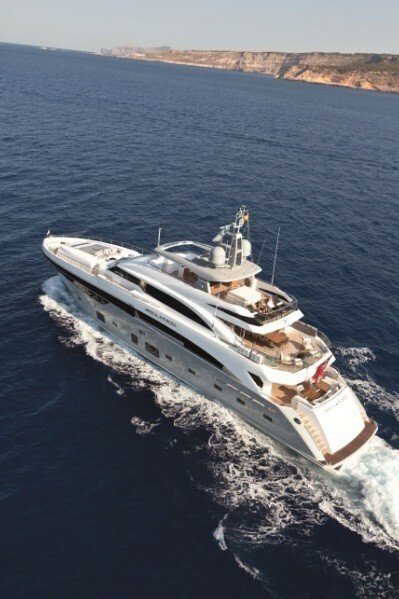 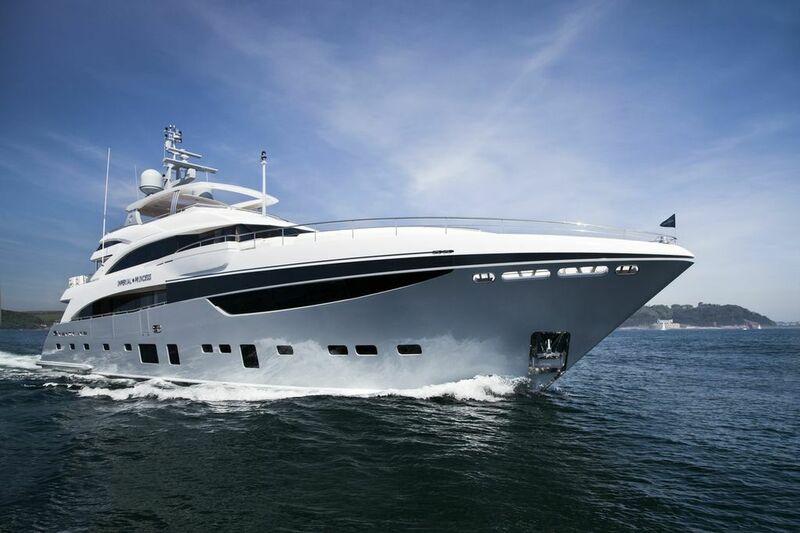 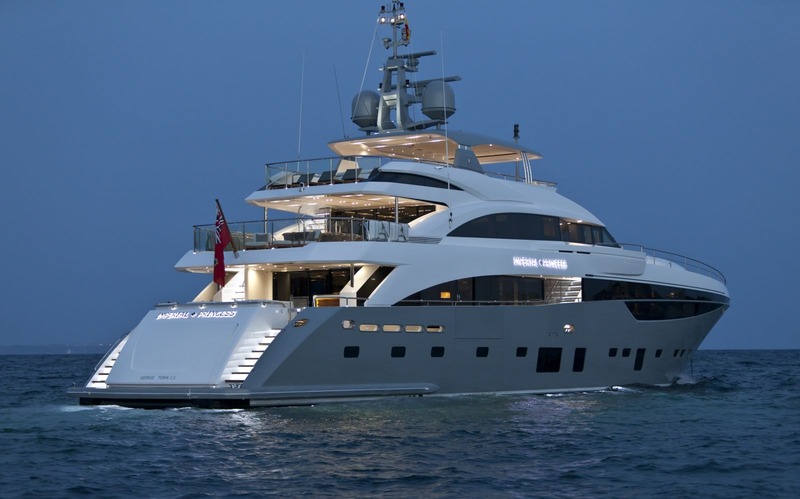 Twin MTU 12V diesels deliver the 40m superyacht a top speed of 22 knots. 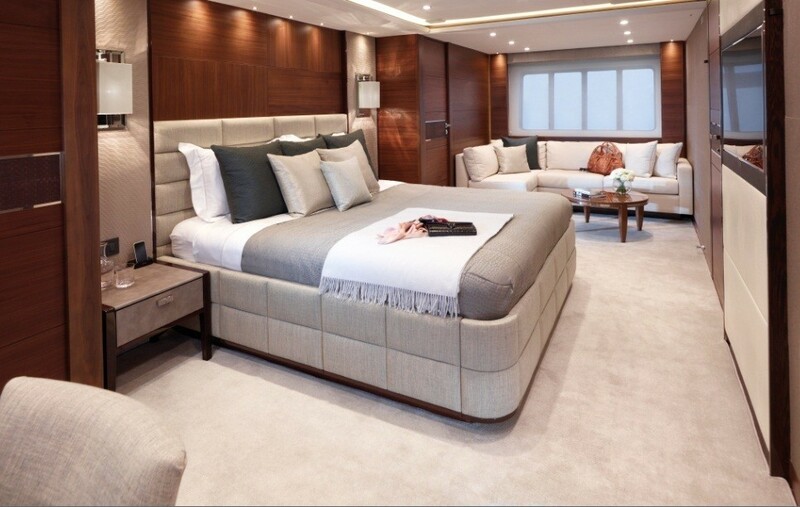 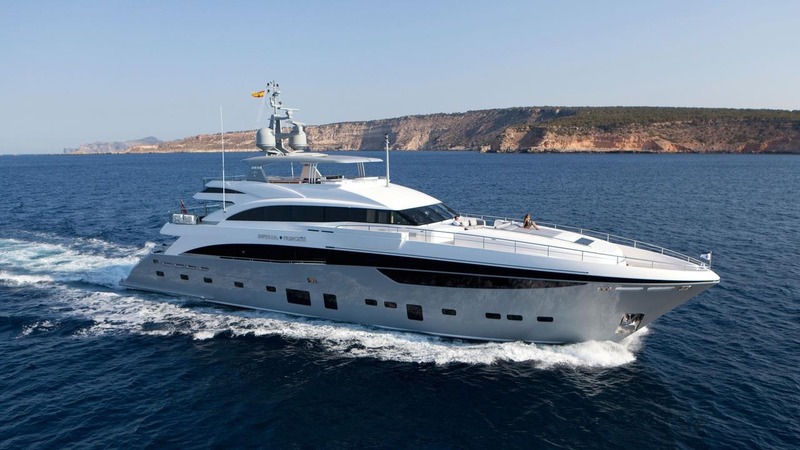 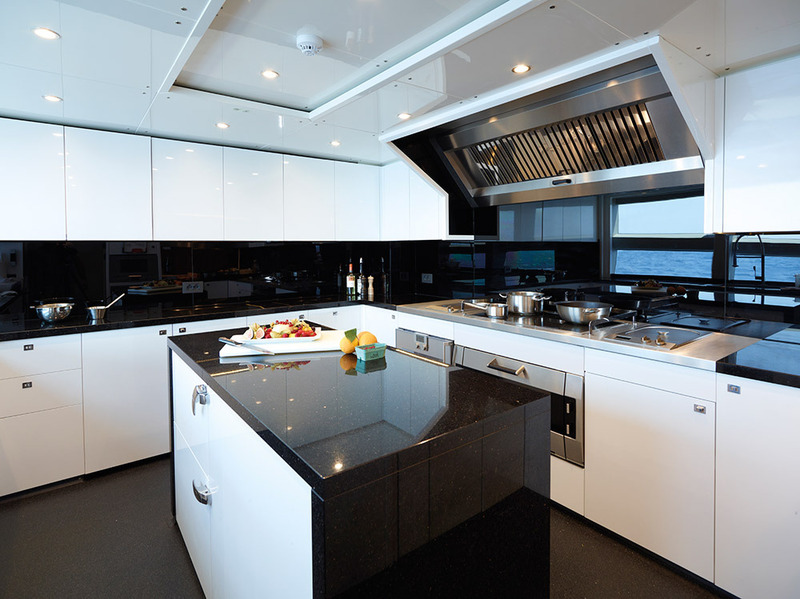 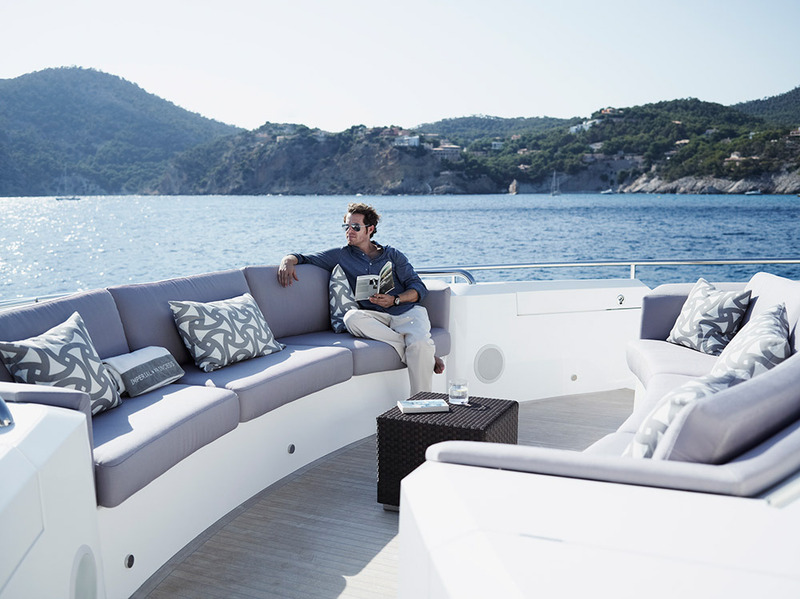 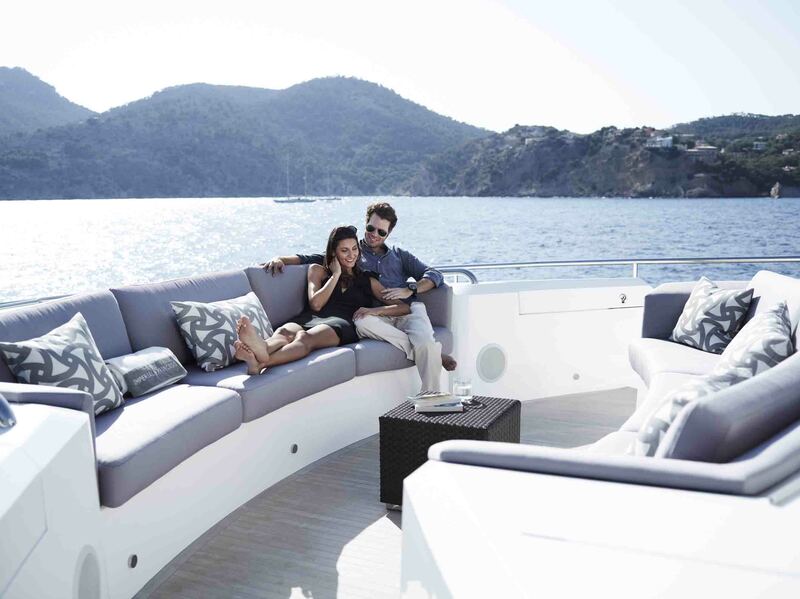 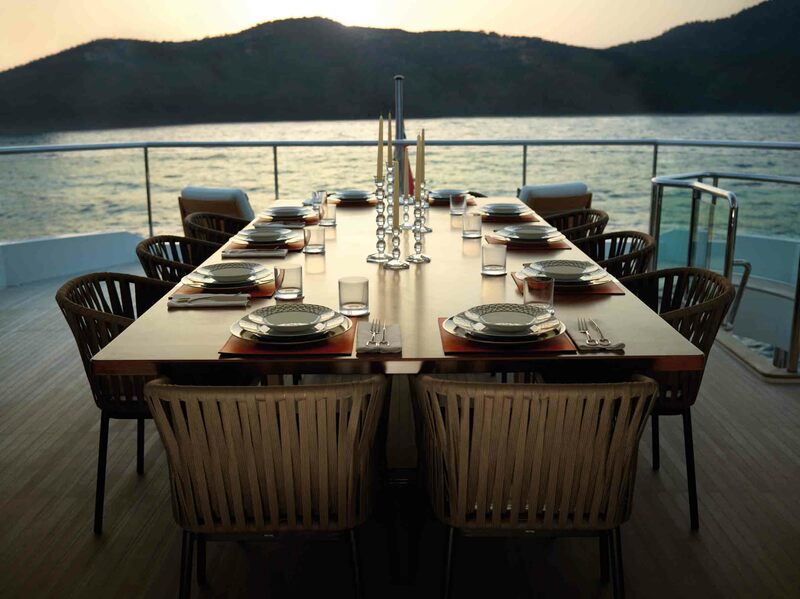 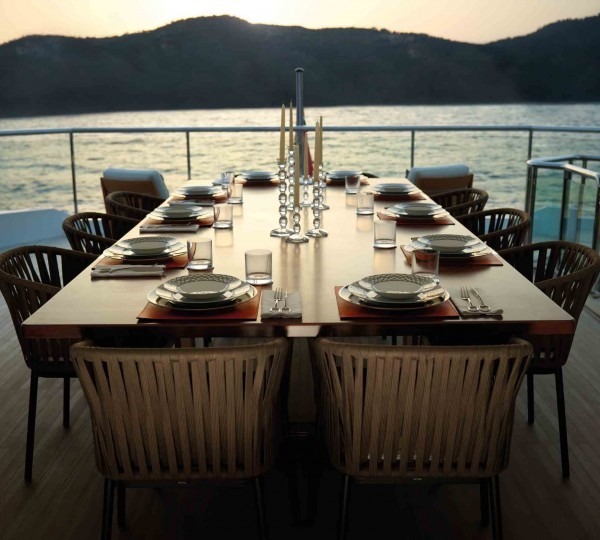 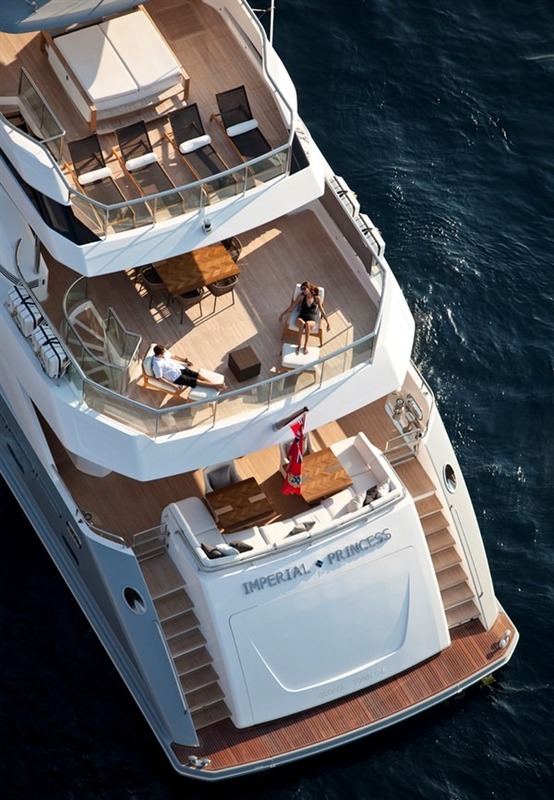 The IMPERIAL PRINCESS BEATRICE motor yacht has an accommodation layout for up to 12 charter guests including a master suite, two VIP staterooms as well as two twin-berth en-suites. 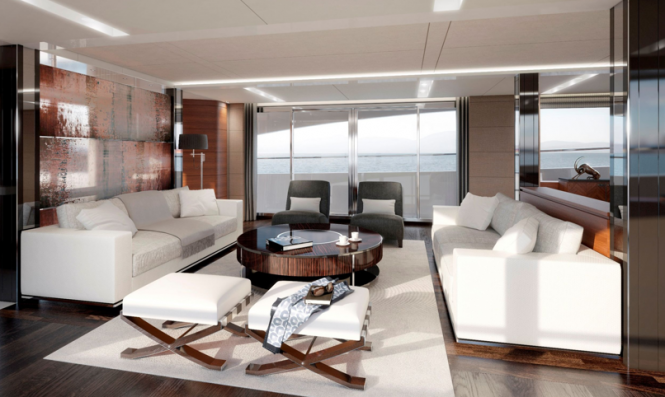 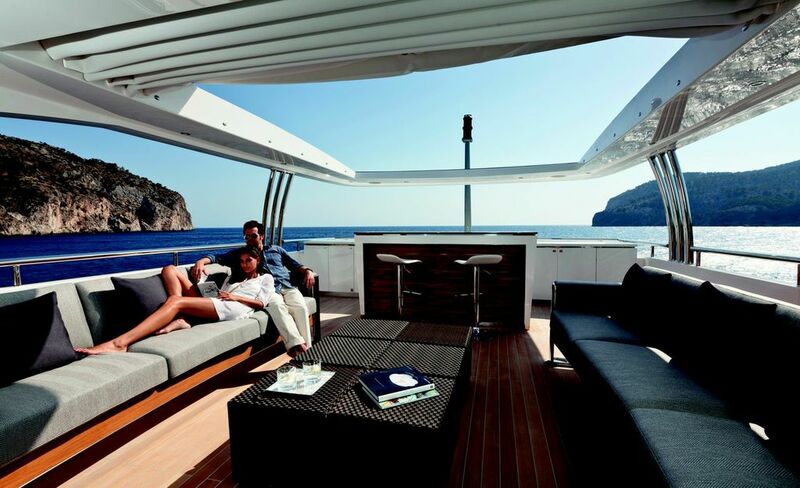 Forward of the main deck is the owner's suite, spanning the full beam of the hull. 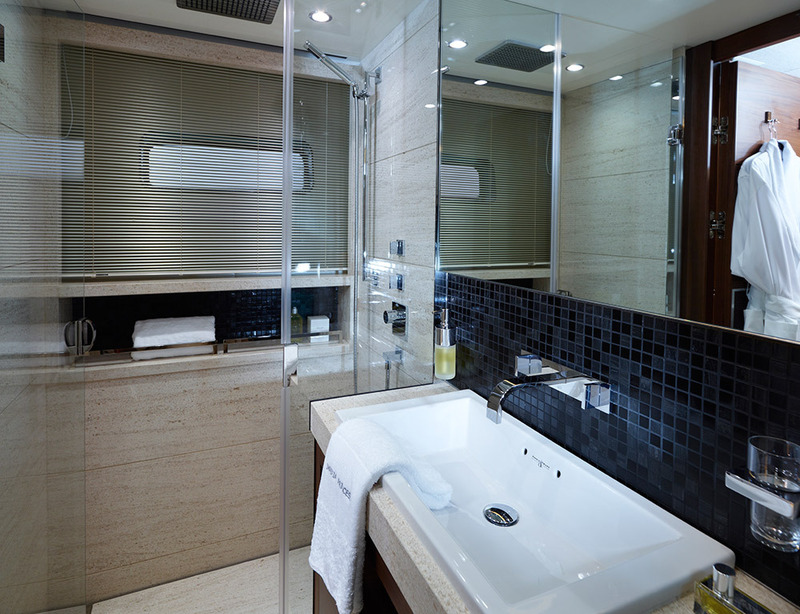 The suite is accessed through the owner’s private office. 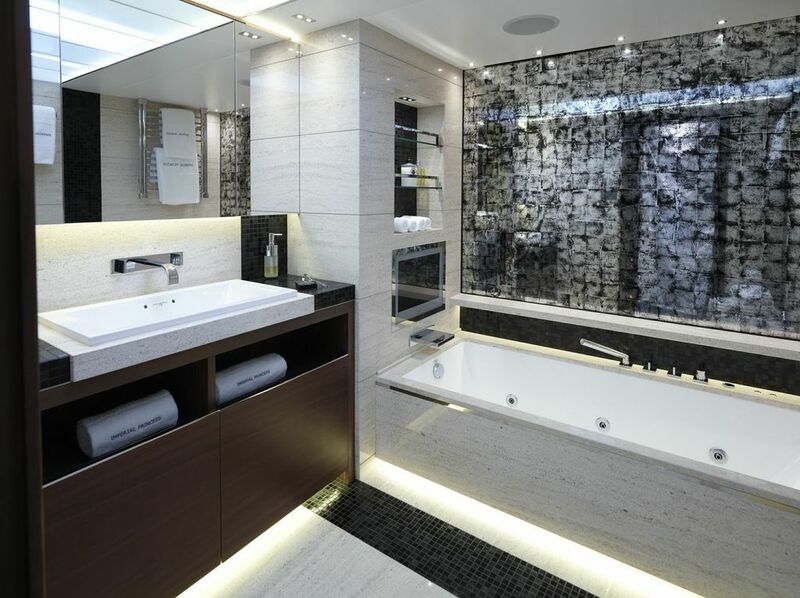 Opulent his and hers bathrooms are accessed off the dressing area which also features two substantial walk-in wardrobes. 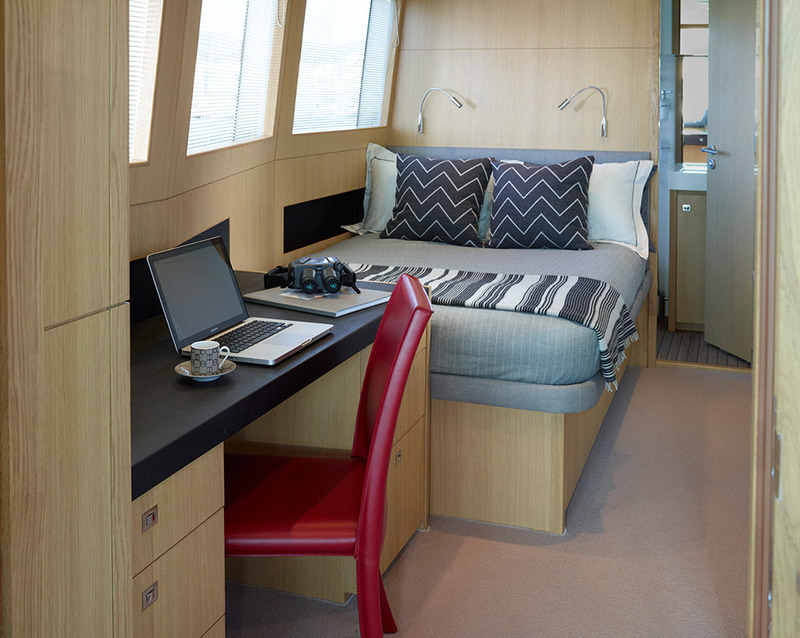 The remaining 4 cabins are situated below decks, with both the VIP cabins occupying the full width of the beam. 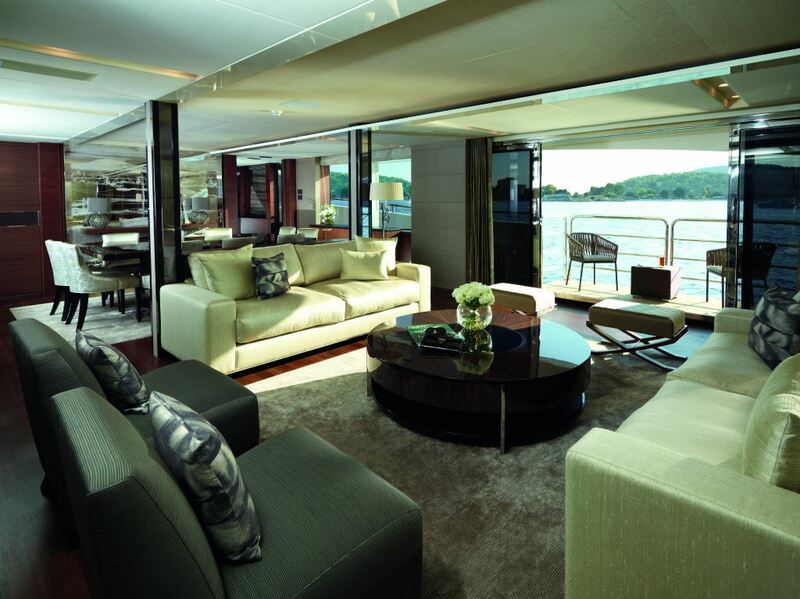 Yacht IMPERIAL PRINCESS - Main Salon..
Yacht IMPERIAL PRINCESS - Side Balcony.